Microsoft’s Xbox One gaming console strives to do it all: It plays games, it streams movies and video (including live TV, if you have a tuner), and it can even host Skype conversations. With Xbox Snap, you can use two of these features at the same time. 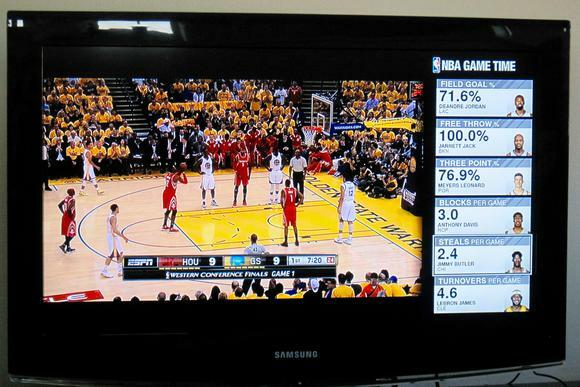 It’s just the ticket for displaying game stats and live scores while you’re watching your favorite sport. Or you can use it to see what your Xbox friends are up—you can even check out their latest achievements. And that’s just scratching the surface of what Snap can do. I’ll show you how to use this clever multi-tasking tool to enhance your TV watching or gaming sessions by “snapping” a second app to the side of your screen. And if anyone from Microsoft is reading this story, I have some ideas for how Snap could be even better. Let’s say you’re watching TV, but you want to know if any of your Xbox friends are online, so you can destroy them during a multiplayer gaming session. Snap the Friends app and you can find out their status without even pausing the show you’re watching. The Vine app lets you stream short-form videos on the side panel, while the Internet Explorer app lets you go anywhere on the web (although the tablet on your coffee table or the phone in your pocket might deliver a superior experience. You can even use Internet Explorer to browse the web while using Xbox Snap. But Xbox Snap really shines with sporting events. The NFL has an excellent companion app, developed as part of the league’s partnership with Microsoft, that makes a terrific resource for reviewing player stats and checking the scores on other games. You can even keep track of your fantasy football updates while you watch the game. The ESPN app is excellent for keeping tabs on live sports without needing to fetch your phone or pause what you’re doing. You can watch ESPN highlights or flick through different leagues to see the most current scores. There are a couple of ways to launch this Xbox Snap. If you have a Kinect, a voice command is the easiest. Just say “Xbox, snap” and the name of the app you want to use. If you’re unsure which app you want to launch, say “Xbox, snap” and then use the controller to select one. If you don’t have a Kinect, you’ll need to use the gamepad. Hit the Xbox controller home button, select Snap from the home screen, and choose the app you want to use. There are many different apps that you can “snap” to the side of the Xbox One’s screen. You can reverse this and get back to full-screen if you wish. The easiest way to unsnap is with another voice command, “Xbox, unsnap.” It’s a little more complicated with the controller: Press the Xbox home button and then select the main TV screen, which will maximize to fill the whole picture. If you run into issues, Microsoft offers an Xbox One Snap help page. There’s a third way, too: Using a gesture. Put your arms to the side, clasp your hands as if you’re grabbing the edges of the screen, and then pull them to the front of your chest. You might get funny looks from any visiting guests, but it works. I like Xbox Snap and have found it an effective means of delivering a second-screen experience the nuisance of pulling a second device that takes your eyes off what's happening on the big screen. The concept's biggest shortcoming, for the time being at least, is a paucity of apps. The absence of a Twitter app is the most egregious example. Everybody loves to follow the running commentary that follows live event. And while the ESPN app is pretty good, apps with stronger game-specific statistics would be welcome companions for any sport. Having said that, every Xbox user should at least give Xbox Snap a try. Master its idiosyncrasies and I think you'll find that's a great tool.